Did you think we would make you Clam & Corn Fritters yet not make you a fabulous dip to accompany it? No way! It was bound to happen, a typo here, a gooflet there. As much as we proofread and read again, we missed one. If you purchased Rhode Island Recipes in print or email prior to today, please note the following correction in the recipe for Maple Syrup Whole Wheat Doughnuts: the flour listed in the recipe should be 2 cups white whole wheat flour, not all-purpose flour. You won't go wrong with all-purpose flour, but you'll get a bit more "healthy" in those doughnuts if you use the white whole wheat. We're so sorry for the error. The softcover print edition currently available on Amazon has the corrected recipe. Coming soon, a brand new cookbook! What happens when two food bloggers get into the kitchen with some favorite culinary souvenirs from their home state? They whip up a cookbook, of course! 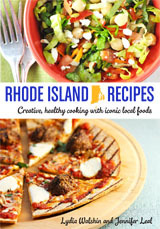 Rhode Island Recipes: Creative, healthy cooking with iconic local foods, by Lydia Walshin and Jennifer Leal, includes 30 family-friendly dishes – appetizers, mains, sides and, yes, a few desserts -- that combine products from 17 Rhode Island companies with fresh local ingredients.